I Think I’m Taller! – Run. Ride. Roam. Peak hour in Piacenza is a pretty wild affair! We left our funny little motel at 8:30 this morning, straight into the bumper-to-bumper, honking maelstrom of traffic. 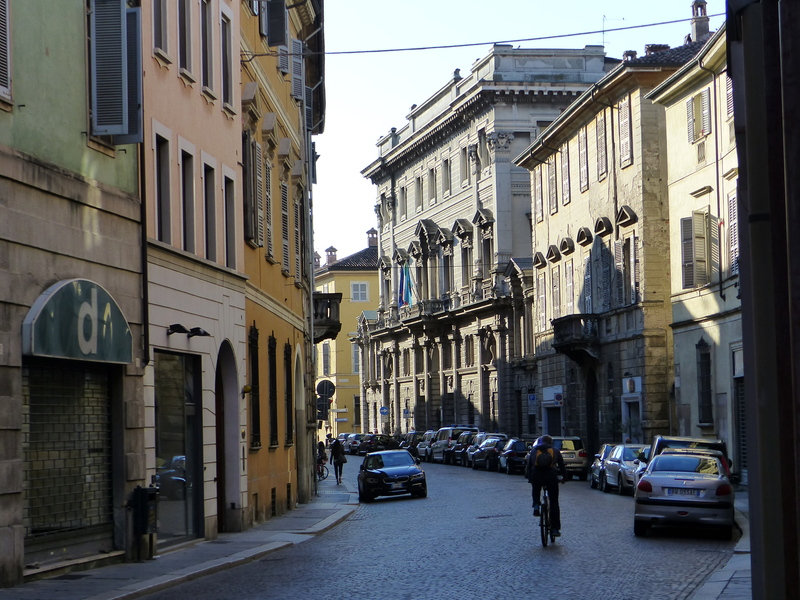 We nudged our way through the cars and trucks, then into the city streets with their cobbles and roundabouts. What a hectic start to the day! We zipped into and out of intersections, around confusing roundabouts and along busy roads heaving with early morning traffic, then out onto the straight, main road out of town. On the main road, we had a van come towards us and give a resounding beep-bi-bi-beep-beep on the horn and the driver gave us a cheerful wave and broad smile. What a nice man and a lovely, encouraging gesture. That busy road went on and on and on. It was nice and straight, but it was another one that didn’t have a shoulder to ride in and still had those darn cracks and holes all over the place. So, it was another 20km to start the day, of serious concentration and having cars and trucks zip and roar past our elbow. It was another glorious, sunny day though, so we rode along under the splendid, warm sun. 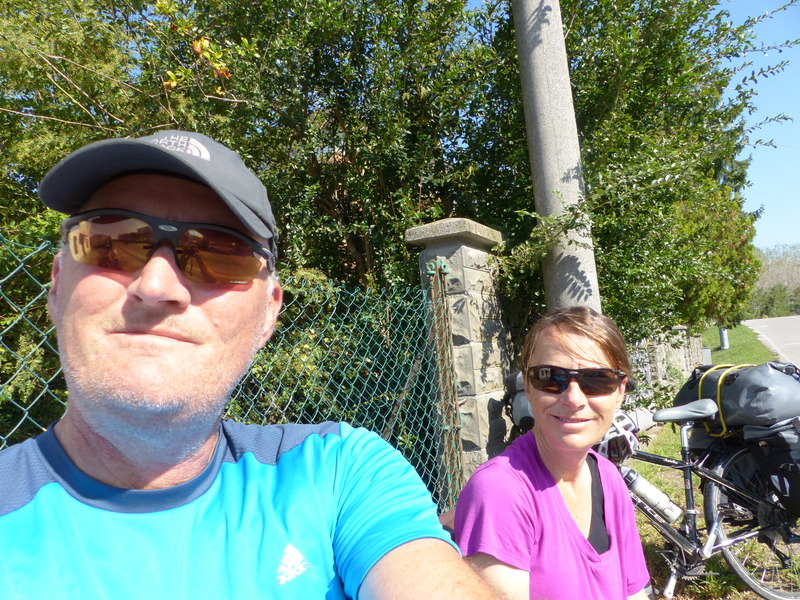 We stopped on the side of the road, to take a brief breather from the traffic and the sweat was already dripping onto the bike, or maybe that was just the sweat of stress from concentrating in the traffic! It was nice and warm too though! We eventually came to some quieter roads and as we pedalled along, a man on a motor scooter zipped past us and gave a beep-beep on his horn, a couple of double-takes as he looked back at us and gave a wave. We attract attention on the street and on the road, being the curiosity that we are! It was very nice to get another friendly wave and toot. The wind was blowing and the headwind made things tough going at times, but we pedalled along at a pretty good clip, bolstered by the sunny weather. Now we were passing some countryside and fields, with men bending over the tilled soil, seeing to their plantings and tractors doing their laps around the paddocks. Steve was riding a short distance ahead of me and he passed a paddock with a farmer sitting in his tractor near the fence. It roared into life as Steve went past. I came along, just as it started to make its way up the paddock and I turned to watch it spring into action as I approached. Then, I hit the brakes…quick smart…in a hurry…with a screech! I had just discovered what the tractor’s job for the day was…spraying liquid manure over that ready-to-be-fertilised field! The pumps out the back of that mighty vehicle were spraying torrents of that aromatic liquid onto the ground, but also…into the air. Now, as I mentioned earlier, it was very windy, and as I may have also mentioned, we were riding into a headwind. Now, what does that mean for the direction of that liquid manure?? Yep, I was straight downwind of it! I watched the manure mist float through the air, right in my direction! I had braked as soon as I realised what was happening, to avoid the thick of the stinky spray, but since I wash’t wearing a hazmat suit, i was going to wear some of that mist for sure! I could do nothing but wait for the mist to disperse, all the while watching it disperse in my air space. So, I was given a light fertilising this morning! The droplets eventually floated away sufficiently for me to pedal on and you know what, my legs felt different on the pedals! Are my knees bending more than usual? Does my seat feel shorter all of a sudden? Are my legs just a little closer to the ground? I think I’m taller! I think I’ve just worn a spray of liquid fertiliser and I’ve just added a few inches! That’s potent stuff! We had been heading for the Po Path again, beside the river and we eventually made it to this traffic-free, quiet path. We pedalled along and as it was now approaching elevenses, we thought it was time to start scouting for a suitable location. 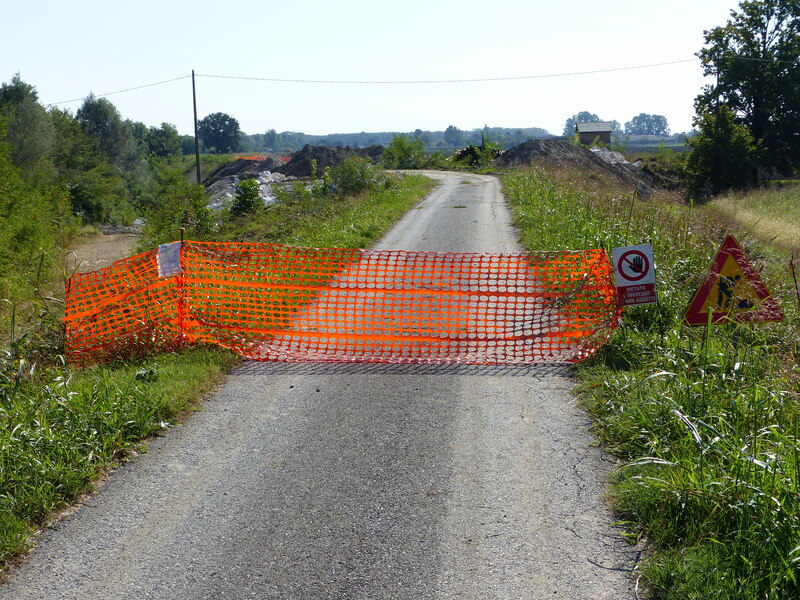 Just as we were doing this, our eyes fell on some colour up ahead…orange…orange tape…an orange barrier! Oh no! Right there across the path was a very definite, do not go any further, stop and go back, path closed, barrier, complete with signs we couldn’t read. Do we have to go all the way back!? Steve decided to walk up the path a bit to see what it was all about, while I waited and hit the smart phone for some quick translations. Yep, the sign said levee closed, so it looked like they were working on a bridge. Steve returned from his recognisance though, convinced we could get through. In situations like this, I have to really work hard to suppress my goody-two-shoes brain, because I really don’t like to break the rules and I really don’t like to get into trouble and I really like to try and do what I’m told and that sign definitely said we shouldn’t go any further and the bright orange barrier was there to support that information. So, with my worries bubbling away, we walked the bikes to the barrier, Steve walked his bike down the incline and around the edge of the plastic fence. I hopped over and held his bike while he brought mine through, just in case I managed to let it topple down the incline instead of around it. Then we walked them through all the bridge work (no one there working today) and then over and around the barrier at the other end. Right, I thought, now let’s just mount up and skedaddle out of here! Like felons on the run, we pedalled along the path until we came to a road with other cyclists and cars, so it felt like we were in safe and acceptable territory again. We recommenced our elevenses scouting and finally saw a bench on the side of a street, just off the main road. We’d ridden just short of 40km by this time, so a snack was welcome. The bench was right on the side of the road and in front of houses, so we couldn’t set up the camera, since that would have meant sitting it in the middle of the road. A quick snack helped replenish the fuel stores and off we went again. 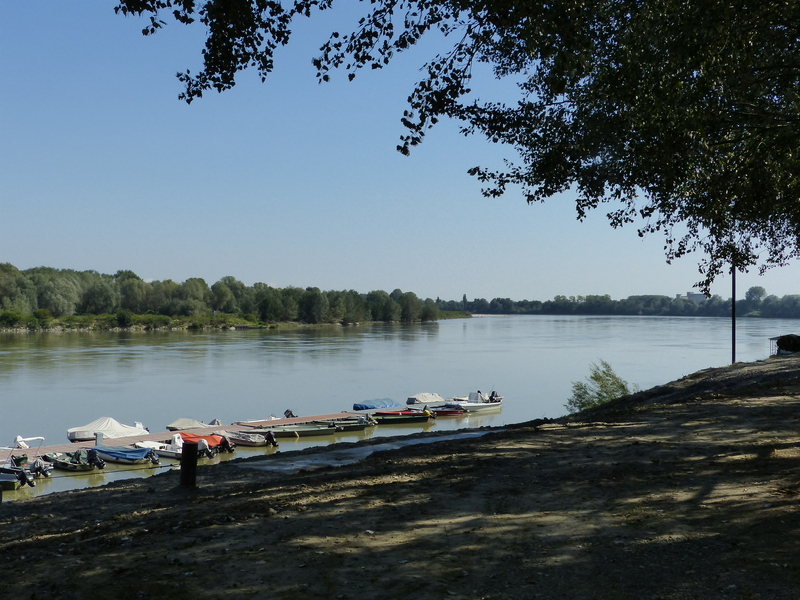 We wheeled along a fairly quiet road, then our GPS told us to take a left hand turn, which we did and ended up on a path beside the river again. This is nice, I thought. Then the river path stopped and a gravel path replaced it, so we continued along that, only to find ourselves in the middle of a cement works! There we were, riding between the mountains of sand and gravel that you see at cement factories. “This doesn’t seem right!” I said to Steve. “I can see the road up ahead,” he replied. So after getting bogged in the sand, we got off and walked the bikes between the hills of sand and eventually onto the road…the same road…the same road just a few hundred metres further on from where we’d taken that left had turn! What was the point of that! That darn GPS had taken us off a perfectly good road and sent us through a cement works as a pointless detour, before taking us back to the road we just left. That machine needs a hefty slap at times! We stopped in another town for some lunch, sitting in the shade of a tree and researched somewhere to stay. We found another cheap and cheerful hotel, so off we pedalled. 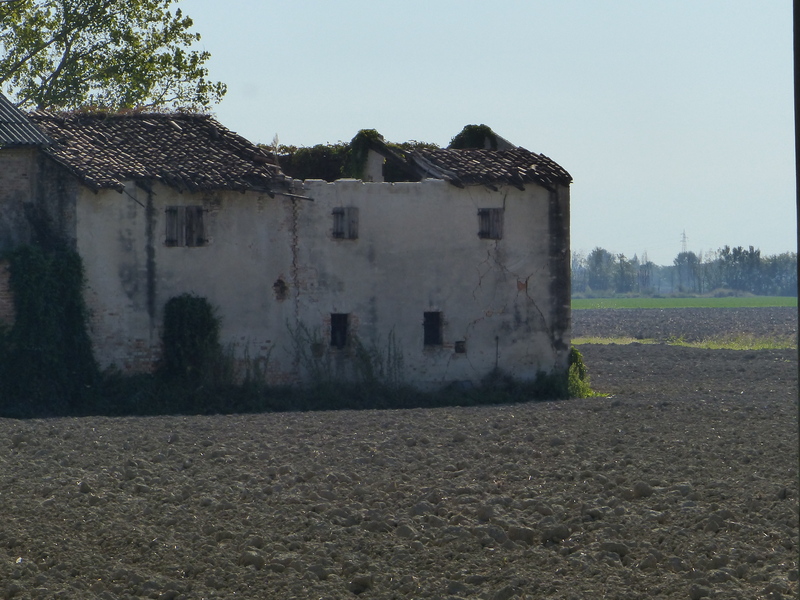 The GPS hadn’t been able to recognise the address, so we set off in the general direction of the hotel. We were back on the Po Path again, which was great with its smooth flat surface. “A little bit of help please,” I smiled. I showed her the address we were trying to find and she did her best to help, but she wasn’t sure of the location either. We told her not to worry, we’d find it. She was so nice and it was so good of her to stop and offer help. We managed to get the location on Google maps, so we ditched the Garmin and just followed the map on the phone. The next 5km, were, in a word, awful! It was a really, really busy road, with truck after truck after truck grazing our shoulder. There was no room on the side of the road to get away from them and it was really quite scary. The hotel finally appeared and it turned out to be something like a truck stop, with a hotel at one end and a bar and restaurant at the other. We waited while the hotel proprietor turned up to check us in and when he did, he was very welcoming and friendly. He gave us a good spot for the bikes and the room is actually really nice, so all was well. We had ridden 79km and at this point, we would usually head out for supplies. We were nowhere near any form of grocery store though, so it looked like our long ride was going to end with an emergency dive into the snacks, breakfast or crumbs in the bottom of the pannier! After a little rest, we decided to go and check out the truck stop restaurant. We sat down and the waitress came to take our order. “Could we have a menu?” we asked. “I am the menu,” she said, and commenced to tell us what was offered on the set menu. It turned out to be fantastic. We had some pasta with tomato and basil sauce for “first meal” as it was described. This was followed up by meat offerings of pork done a couple of different ways or turkey. I said I was “vegano” and she was immediately accommodating, saying she could do me a big salad instead. Perfect! So Steve tucked into turkey and fries and I had a giant salad and it was super. Then, nicely fed, we walked back to the room. I really liked the ride today. It was pretty long, but the sun shone and it was a great day. 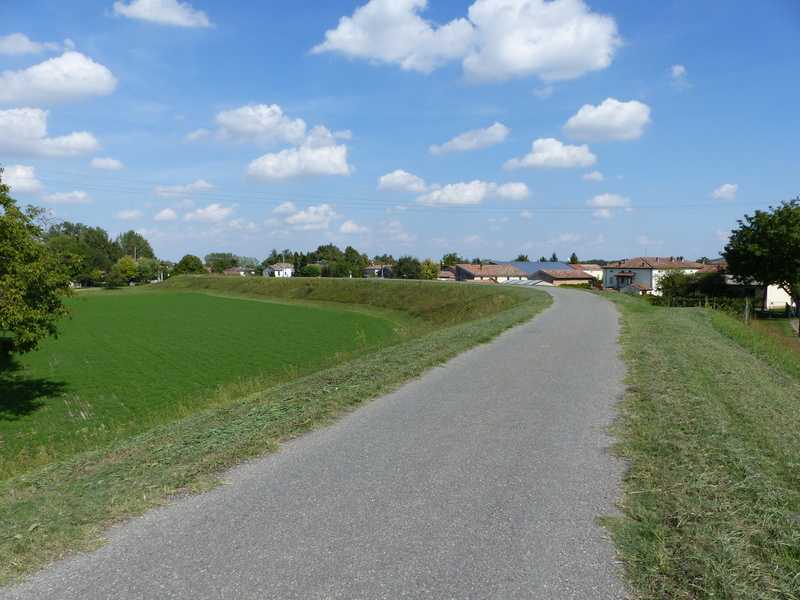 The only problem with the path we were on, was it didn’t really go into any towns or give us much scenery, so not many photos, but the trade off was a nice, flat ride. We’re still deciding where we’ll head tomorrow, and that’s part of the fun of this form of travel, making it up as we go along. I’m sure it will be an experience and an adventure, wherever we end up. I’ll just have to remember to duck my head when I go through the door in the morning, who knows how tall I’ll be by then!